Don’t Miss the 48-Hour Home Sale! Don't Miss the 48-Hour Home Sale! Leave it to Macy’s to sneak a new sale in for us…and an online only one at that! But let’s be honest – nothing gets by you because you’re a smart Magic Style Shop fan who know we’ll always keep you up to date with the latest and great Macy’s deals. Yes, basically, we’re your one-stop-Macy’s-shop. So what’s the deal? I’ll tell you: for only 48 hours online, Macy’s is having a – you guessed it – Home 48 Hour Event. But this is what you won’t believe. 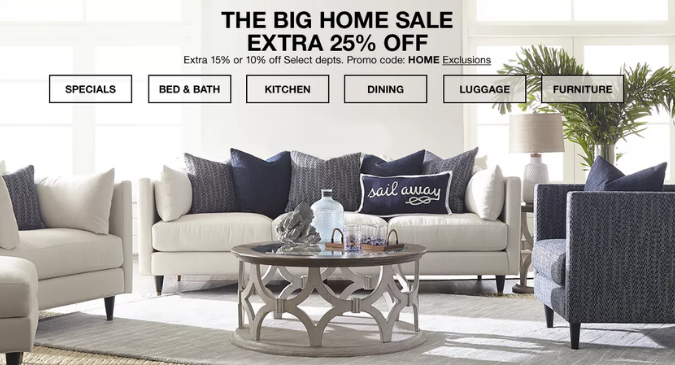 Instead of the typical 15 or 25 percent off we typically find during a Macy’s sale, you can save up to 50% off your favorite home needs! We’re talking everything from bedding and bath rugs to luggage and lighting. Hotel Collection- Ultimate MicroCotton Bath Towel Collection, 100% Cotton- originally $16-68, now only $9.60- 40.80! Make sure you use the code HOME at checkout to save. Of course, there are many more deals to discover during this 48-Hour Home Sale, just not a lot of time to discover them. So don’t delay!